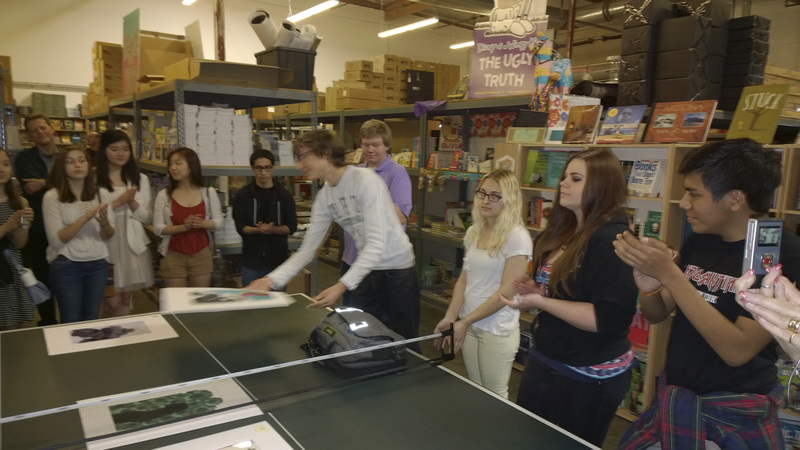 On March 1st at Phoenix Book Company in Tempe, young authors select the cover art to YAA’s “Bloom: Best Arizona Teen Writing of 2014.” On April 12th at Mountain View High School in Mesa, the book became reality as Bloom enjoyed its public release. April 12, 2014-Hundreds of mentors, family members, and grade 7-12 Scholastic Writing Awards honorees gathered to celebrate YAA’s 2014 Scholastic Writing Awards Ceremony at Mountain View High School in Mesa. Organized by Mountain View High School English teacher Tracy Weaver with major contributions by Mountain View’s MOSAIC literary magazine club, YAA Secretary Julie Cain, Phoenix Book Company, and YAA Judging Coordinator Kelly O’Rourke, the ceremony was an evening of “Bloom” for young authorship in Arizona. The reading of honoree names, ceremony speakers, and two key YAA announcements distinguished April 12th as a landmark evening. YAA co-founder Jay Morganstern identified the young authors that earned Honorable Mention, Silver Key, and Gold Key awards while supporters in attendance–friends, families, mentors–witnessed their honoree stage ascendancies. Many 2014 American Voices nominees and national medal winners–Devin Farr, Nailah Mathews, Madeline Lee, Nicole Dominiak, Navya Dasari, Kimaya Lecamwasum, Alice Zhao–read their writing before the audience, some drawing standing ovations. This is Bloom, the Young Authors of Arizona’s Best Arizona Teen Writing of 2014 anthology, the first of its kind in state history: by young authors, for Arizona, earned publication through the Scholastic Writing Awards. YAA is the only Scholastic affiliate in America making our own “best of” book, and we’re looking to make publishing a habit. Mountain View High School Art teacher Jon Jeffery contextualized YAA’s announcement that it is now Arizona’s Alliance for Young Artists and Writers affiliate. Arizona’s grade 7-12 authors and artists can now plan on submitting work in all 28 Scholastic Art & Writing Awards categories; 2015 entries will be due on December 17, 2014. Arizona native Tom Leveen, author of various novels (including Sick), shared his journey to becoming a published author, citing how 41 agents rejected him before he “got into (the publishing) game.” Leveen, a Phoenix New Times Performing Arts Category “Big Brain Award” recipient and the artistic director at ChyroArts during its iconic three-year run as an all-ages music and performing arts venue, engaged the crowd and at one point got everyone to stand up and cheer… for themselves. Encyclopedia Show AZ, a “semi-educational, multi-genre variety show,” brought their popular improv skills to a discerning audience, working on the apropos theme of “bloom.” Attendees were also invited to Encyclopedia Show AZ’s free”Video Games” performance on April 19th at “The Empty Space,” a performing arts venue on Arizona State University’s Tempe campus. The evening’s keynote speaker was Arizona Poet Laureate Alberto Rios. Rios read his own work but also emphasized the importance of sharing stories and getting those first drafts out.